The dramatic story of Jesuit priests bringing Christianity to Japan captured the attention of an ailing Japanese Catholic author, an award-winning filmmaker, and a Mormon professor of Japanese. Together, they brought the story to the world. It was a harrowing choice: renounce one’s faith or submit to excruciating torture and possibly death. In the early 1600s, tens of thousands of Japanese Christians—along with the Jesuit missionaries who taught them—faced that decision as the country’s new rulers banned the fledgling religion, which had grown rapidly after being introduced to Japan 70 years earlier. During what came to be known as the Kakure Kirishitan (Hidden Christian) period (1614–1873), Christians were detected when they were forced to step on fumie, tablets showing images of Jesus or the Virgin Mary cradling the infant. Those who refused were identified as Christians and persecuted or killed as a result. To avoid that fate, however, some believers chose to step on the tablets and apostatize from the faith. “The Japanese government was very efficient in wiping out any traces of Christianity,” says BYU Japanese professor Van C. Gessel, who as a young man was captivated by this harrowing tale as told by Japanese Christian author Shūsaku Endō. Endō’s novel Silence has recently been made into a movie by Academy Award–winning filmmaker Martin Scorsese, who hired Gessel as a literary consultant. In an unlikely collaboration across time and distance, a Japanese Catholic writer, an Italian-American Hollywood director, and a Latter-day Saint professor have together helped bring this story of faith and discipleship to the world. While hospitalized for a persistent bout of lung disease in the 1960s, Endō learned about the Japanese martyrs from the Kakure Kirishitan period and wondered why some chose to apostatize and some chose martyrdom for their beliefs. “Endō saw in these stories his own quest to cling to faith in the face of pain and suffering and God’s purported silence,” says Gessel. Years earlier, after the divorce of his parents, Endō (1923– 1996) had been introduced to Catholicism by his mother. His conversion and his struggle with Christianity became a recurrent theme throughout his writings, and the stories of the Kakure Kirishitan would make their way into his most famous book, Silence. Silence is based on a historical account of a Father Ferreira, one of the Jesuit priests commissioned to bring Christianity to Japan. Set in the 17th century, it tells of two young Catholic priests—Rodrigues and Garupe—on a mission to minister to the underground Christians and find their mentor, Father Ferreira, who is alleged to have apostatized. Published in 1966, Silence has remained consistently popular in both the United States and Japan and was named one of the 100 Best Spiritual Books of the 20th century. Gessel first read Endō’s Silence as a young returned missionary in early 1972. The narrative of Jesuit priests teaching Christianity to the Japanese people struck a chord, given Gessel’s own proselytizing experience in Japan. The story influenced him so deeply that, as a graduate student at Columbia, he wrote a fan letter to Endō offering to translate one of the author’s books into English. Gessel received a quick and enthusiastic reply and they began a regular correspondence and working relationship. Gessel would eventually become Endō’s official translator; to date Gessel has translated five novels and two short story collections by Endō. “I had the unique opportunity, over the course of more than 20 years, to know and work closely with Endō, both as his translator and as a friend. It was a privilege few translators these days are able to enjoy, and I got to know him as a deeply thoughtful, captivating writer and as a delightfully humorous man,” says Gessel. Why do so many readers relate to the journey of protagonist Father Rodrigues to bring Christianity to a foreign land? Gessel suggests that perhaps they find themselves in the story of the young Jesuit priest, or perhaps they see in the novel their own struggle with silence from God. The reader experiences inner conflict and growth along with the main character. “When Rodrigues first comes to Japan, he’s naïve and inexperienced in teaching his beliefs in a foreign land—not unlike LDS missionaries, confident in themselves and in their message—but there are barriers to people of any background in responding to a new faith,” says Gessel. Also compelling to many readers is the relationship of the priest Rodrigues and his parishioner Kichijirō, which contrasts the themes of strength and weakness. Rodrigues sees the drunken Kichijirō, who brings the priests from Macao to Japan, as a weak Christian because he apostatizes and betrays him in “Judas-like fashion” to the Japanese authorities. Years ago, before he entered film school, Martin Scorsese considered becoming a Catholic priest. Scorsese took a year of training for the ministry but failed out at the end of the year. 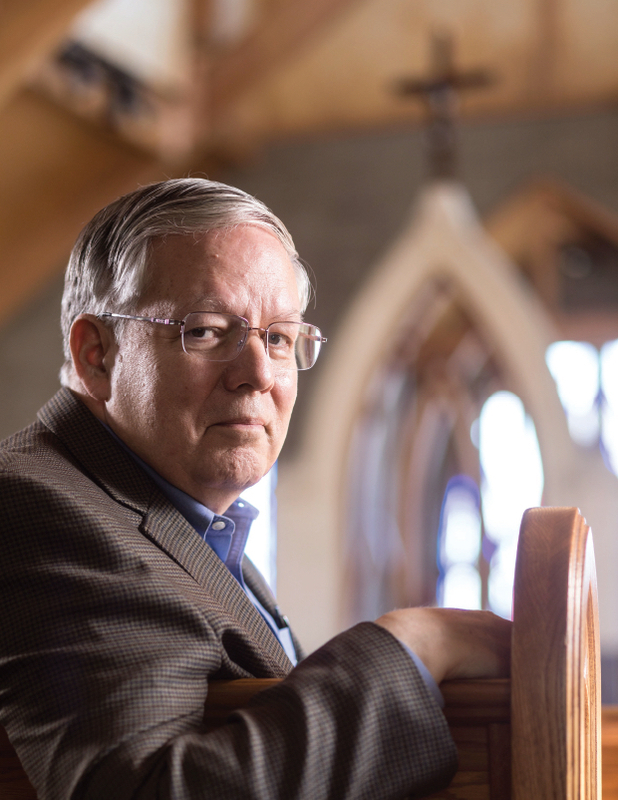 As he puts it, “Christ said many are called but few are chosen, and I discovered I was neither called nor chosen.” So, when an Episcopalian minister later gave him the book Silence, the story of the young priests’ struggles resonated with him. He read it frequently, corresponded with Endō, and began a 28-year “passion project” to bring the story to the screen. After being invited to consult with Scorsese on an adaptation of Silence for film, Gessel responded to hundreds of requests about the text, translation, setting of the novel, time period, and Japanese culture. He also shared his own personal translation of key portions of the novel with Scorsese’s team. “I spent quite a bit of time encouraging Scorsese to consider the original Japanese because it’s quite different from what’s happening in the English translation. There were also tiny details they asked about,” says Gessel. After a screening of the film in September 2016 with Scorsese, Gessel offered several suggestions to Scorsese’s team that they captured in the final cut. “I was amazed that a director of his stature was willing to listen to this scholar who translated for Endō. We had a lot of back of forth, but I am pleased with the film because I can see he was receptive to my explanations of the original text, as well as my own interpretations of it,” says Gessel. Scorsese personally thanked Gessel for his assistance: “No words to describe my thanks to you for all you’ve done to help me realize Silence. Your guidance and support was incalculable.” The Silence premiere was held in Rome at one of the Vatican’s Pontifical Institutes. As Endō’s chief English translator, Gessel has a unique view of the nuances of the Japanese-to-English translation of Silence, which had already been published when Gessel became Endō’s official translator. Although Gessel attempted to get permission from the British publisher to do a new translation of the novel, he was unsuccessful. Gessel feels passionately about clarifying errors perpetuated in the translation—one error in particular. “There is only one published English translation of Silence, and since many of the translations into other languages have been translated from the English, the mistakes are perpetuated in other languages as well,” says Gessel. The translation error is highlighted during a signature moment of testing for Father Rodrigues, when he must decide whether he will apostatize by stepping on a fumie. The Japanese authorities tell him they will release the Christians who are being tortured if he will simply step on the fumie. As Rodrigues raises his foot he hears a voice speaking to him from the image. “The English edition of Silence has the voice of Jesus Christ telling Rodrigues, ‘Trample!’ It is an imperative. It communicates, ‘Just do it!’ It presents this key moment to the reader as an angry command from Christ to Rodrigues to trample on His image. There is no sense of acceptance, love, or forgiveness when you make it a command. However, the voice of Christ in the original Japanese text actually tells Rodrigues, ‘It is okay for you to trample,’” says Gessel. But is this simply a nuanced word or subtlety? Gessel argues that it goes to the heart of the novel and what he has confirmed was Endō’s intent. A common misconception of Silence, says Gessel, is that it focuses on violence, when in fact it is about what any honest Christian goes through when dealing with doubt that can grow into faith. WEB EXTRAS: Click on the links below to read Van C. Gessel’s alternate translation of Silence Chapter 8 and watch his lecture on the making of the film.